TL;DR: Best flies and spots for the Westfield River East Branch. The prettiest river in Massachusetts. As spring arrives, I often will be fishing the Westfield East Branch. It is my favorite Massachusetts river. I once hooked a massive brown there, and there is a report of three- to four-lb. browns living in the more remote areas. Beautiful, no crowds, and, a C&R area. I have had 50-trout and 60-trout days there, and five to 10 fish is the norm when I go. IMO, the river is under-fished because it’s under-reported. The last Orvis fishing report, for example, was filed in 2012. There is a great deal of water to cover, but some tips for DIY are below. Be sure to bring food and water and note that there’s no cell coverage there. 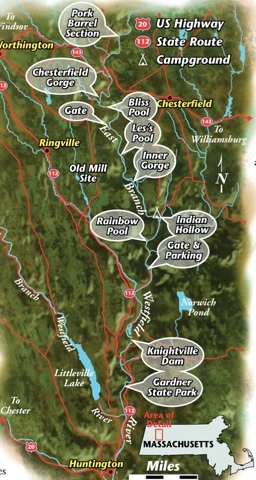 Take a look at the map below to familiarize yourself with the river. Monitor the water flows. Much of the river is above a dam, and the water flows measured by the USGS here are based on a gauge below the dam. But, though it is a rough proxy, it works more than fine; I really like it when the water is about 125 to 250 cfs. Spring and fall are great times to fish it during the day. Bright days in August aren’t great, but I’ve still caught fish there nymphing. Dawn, dusk, and cloudy days are best during the summer. But, you know that. Bring a water thermometer in order to predict where the trout will be (more on that here). This is a freestone, and so, water temperatures will vary. I tend to nymph and fish dries, as I am not a streamer guy. I’ve accessed the river in two ways: arriving at the north end or the south end. 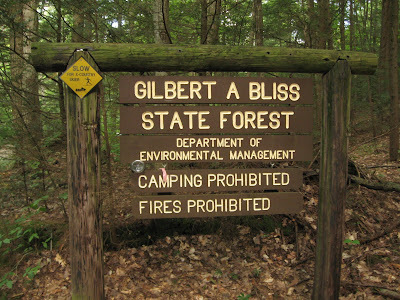 For the former, which I do 90% of the time, GPS your way to the Chesterfield Gorge area. There’s a dirt parking lot, which is maintained by the Trustees of the Reservation, for $2.50 per adult. Or, you can continue down River Road, which is a dirt path, and occasionally very rocky for the first 150 yards, and park at any of the pull outs that dot the road for miles as you head south. For the latter, you can go down a smooth dirt road, Old Worthington Road, off Route 112. Go down past the dam, turn right, and keep going to a dirt lot (GPS coordinates here). Then, fish your way north. You can access the river via Indian Hollow, but I’ve never done it, and so, cannot vouch for it. I really like the pocket water that is all over the river. It’s great for tightline nymphing and dry-dropper set-ups. But, if you like longer stretches and easier wading, the spots below work well. That’s what I call it. If you park at the Trustees’ lot and walk south, you’ll be going downhill. Once you’re at river-level, look left and you’ll see some pocket water. If you then head north along the bank, there on the left will be a very nice and long nymphing run. It’s a deep channel, where the water is running next to a ledge. Some great fish hold there. Float some nymphs and an indicator through there. That’s a nice and calm pool that features excellent dry fly fishing. There are some good nymphing runs south of there. To get there, drive south on River Road until you see the sign above. There’s ample parking near the sign. To me, this is the best spot. It’s a shaded and very large pool, where trout can shelter during the hot summers and cold winters. If you drive south on River Road for a few miles, you then will come up on a yellow gate. Park near there and walk south for about a mile. You will see some huge hemlocks. On the opposite bank, tucked into some woods, is the sign above. Les was a very beloved angler. His friend Gary Metras, a Swift regular, shared with me the story about how Les unfortunately passed away just a month into retirement. So, Gary and some friends erected the memorial sign. This pool is great for streamers or wet flies. Dries can work, too. One day, I was there for a BWO hatch, and with a very long downstream wiggle cast, was able to catch a 17″ tiger trout and an equally big rainbow. Accessed from the south or Indian Hollow, it’s a beautiful and long pool. There’s a tantalizingly comment in 2012 about huge browns in that area. I fished it during a bright August day and was skunked. I imagine it would be a great spot for dry fly fishing. It’s amazingly remote down there. You might be the only angler there. There’s a great deal of caddis there. So, bring some caddis larvae and Caddis Emergers. Pheasant Tails, Hare’s Ears, WD-40s, and Frenchies have done very well for me, too. For dries, I’ve taken fish on plain ol’ Elk Hairs and Stimulators. The water is clear, and it’s fun to see a trout rise and sip leisurely. Then, all hell breaks loose after you set the hook! Have fun at the river. It truly is an amazing place. Thanks for the shout out! See you out there! With your skills, you might be on deck to land one of the big browns there. Check out this old comment here. Thanks for the info on the EB. I have to get up there this year for sure! Hi, thanks for the awesome mini guide to the Westfield. I only make it out there a few times a year, there's a lot of water to cover and it's one of my favorite places in New England. I'm wondering if current flows (around 15-20 cf/s) are just too low for fishing at all? I'm not super familiar with this watershed, so I'm not sure how to interpet that info. Thanks for the blog! Thanks! Yes, I think it would be too low. It's a freestone that is subject to a great deal of temp. variation. I'd wait for the fall stocking, which happens between late-Sept. and Columbus Day weekend. The state posts updates here: http://www.mass.gov/eea/agencies/dfg/dfw/hunting-fishing-wildlife-watching/fishing/trout-stocking-schedule.html. I don't know if the drought has changed their plans for the year. We are getting some good rain this week, and so, hopefully it will raise up the flows and make it safe for any newly-stocked fish. My first post to your blog! I’ve been following you for a while now and am relatively new to fly fishing. I know this is an old post but I’m hoping to make the journey out to the gorge section of the East Branch. What are ideal flow rates for this section? Any particular flies to work well this time of year? I’m on vacation next week and am hoping to explore the area. Thanks! Hi Kevin! Thanks for writing. Answers to your questions at our Westfield East Branch Overview post. Chiming in late here, but this is indeed a wonderful overview. I’m hoping to fish the EB for the first time ever tomorrow evening (if I can find wadeable/fishable water given current flows! ), and your guide will surely help.